The lease assignment is a document that allows a tenant to transfer their interest in a lease agreement to another individual or entity. The party that is accepting the assignment will be agreeing to the terms and conditions of the lease agreement that was signed under the original tenant and will be legally liable to its commitments, terms, and/or conditions. 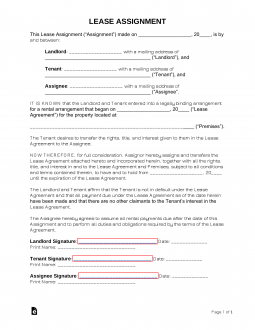 The landlord will usually have to sign the assignment stating that they consent to the transfer of interest and after the original tenant, the new tenant, and the landlord have all signed the form (with the original lease attached) the document becomes final.